This entry was posted on Saturday, December 1st, 2018 at 07:23	and is filed under Quilting. You can follow any responses to this entry through the RSS 2.0 feed. You can skip to the end and leave a response. Pinging is currently not allowed. Cute tea towels! Good luck with your OMG! Those tea towels are really cute! But I understand wanting to do something else. Good luck with your December goal! Love those snowmen. 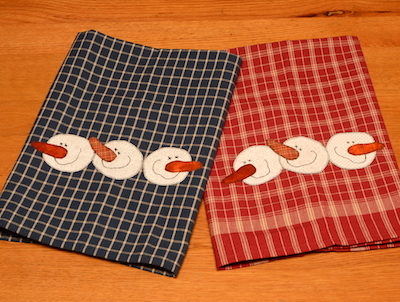 Thanks for linking up with Elm Street Quilt One Monthly Goal and good luck on your project. Your towels are so cute. All the links have such great ideas. Good luck with your goals. I know mine always start out big and piddle down to barely anything. You are smart to be realistic. Best of luck making a decision. I really like your tea towels! The design reminds me of some of the snowmen from Quilt Doodles. I love doing tea towels!